With its importance to the annual Christmas Eve service of Nine Lessons and Carols, the organ of the chapel of King’s College, Cambridge has a good claim to being the most widely heard organ in the world. Like the rest of us, though, it wears out eventually, and it was shut down for a huge renovation in 2016. The entire project, masterminded by Harrison and Harrison, took only nine months, and this is the first recording to be made since it was unveiled. The last recording project before the restoration was the Duruflé Requiem, so you can do your own before-and-after test if you like. I can’t say I’ve noticed a huge amount of difference in the sound, but then I’m not an organist myself, and those who are will, doubtless, have their own insights. Moreover, I guess that preservation of the sound was a key part of the rebuild, so they’d probably be pleased to think that the sound remains fundamentally unchanged. This disc gives us a (relatively rare) chance to hear Stephen Cleobury in the organ loft rather than conducting the choir. There can’t be anyone alive who knows this organ better than he, and he must have felt like he was driving a newly refurbished limousine when he first got back into the seat after the renovation. He has a great time, and so will you as you listen to it. It’s a nice touch to begin with a piece by former chorister and organ scholar Simon Preston. His popular Alleluyas has a processional sense of majesty to it, and it makes for a juicy collection of sounds to begin with. The Bach chorale preludes, from both the Orgelbüchlein and the Clavierübung, draw explicit links to the organ’s function as a worship aid. They're wonderful vehicles for uncovering and, perhaps, polishing the different layers of an organ’s sound as the ear is pulled first in one direction, then in another. They also show off lots of wonderful stops, and I loved the resulting contrast in Christ, unser Herr. In dir ist Freude is pleasantly busy, and Cleobury finds a beautiful vocal stop for O Mensch, bewein’ dein Sünde groß. The F minor organ sonata is a useful reminder that Mendelssohn was a great composer for the organ. It’s a piece of architectural strength and complexity that matches the surroundings of the King’s chapel. Highlights include the beautifully soft stop sound chosen for the lyrical main theme of the second movement, and the sense of build between the third and fourth movements, which has a pleasing sense of growing majesty to it. Harvey Grace’s Resurgam has a brooding quality to its opening, but it builds with a wave-like structure to an impressive cloud of sound at the end. Franck’s Pièce Héroïque swirls darkly in its opening (I don’t think I’ve ever heard the King’s organ sound so French as here, something it isn’t really used to doing!) and has an impressive, fanfare-like conclusion. I found George Baker’s Procession Royale a wonderfully sparky piece, full of energy and lift, with some quirky harmonies and a spiky main theme. It shows the organ off very well, as does the rest of the programme. I was listening only in CD stereo, and I was very pleased with the sound, so I’m sure it’s even finer in SACD. Another fun thing about the packaging is that the booklet contains not only notes about the music, but also some worthwhile essays about the organ and the restoration. Even better, you get some wonderful photos of the work underway, with some fantastic pictures of the empty organ case as well as of the instrument’s inner workings. 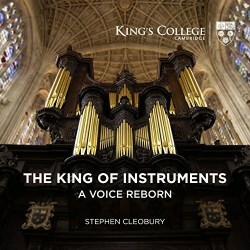 For anyone who loves the organ, or who loves the sound of King’s, this disc is pretty much essential.